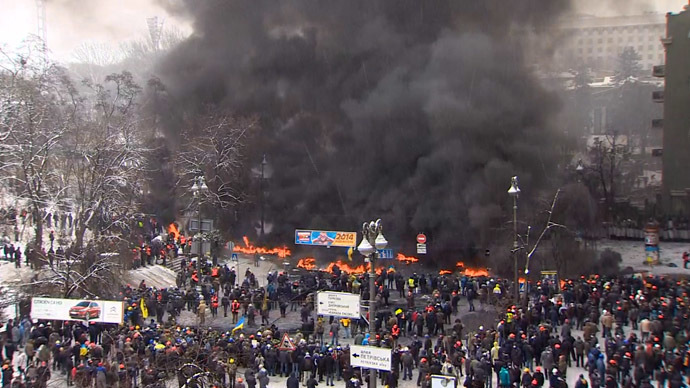 While thousands of people take part in anti-government protests in Kiev, a small group of radical fighters were at the core of the last days violent clashes. And judging by their looks and actions, they are armed, trained and prepared for war. 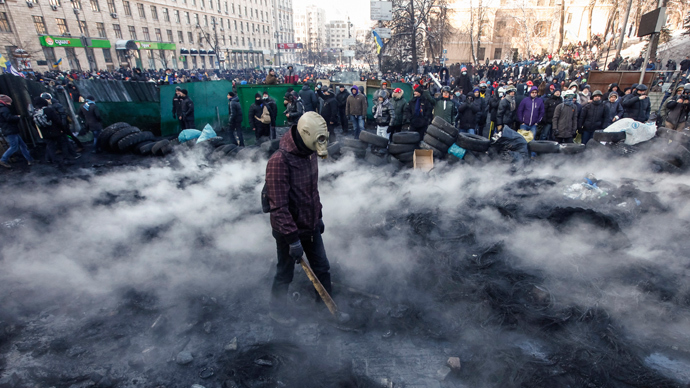 The hallmark of the Ukrainian riots on Wednesday and Thursday morning was the smell of burning tires. Opposition fighters started the fires as the riot police moved in to disperse the crowds in the most brutal action seen in weeks. By nightfall a huge barricade of rubber and flames separated the rioters from police, who returned to their original positions, blocking approaches to governmental buildings. Activists were tossing new tires into the fire in their dozens, as large plumes of black smoke filled the air. 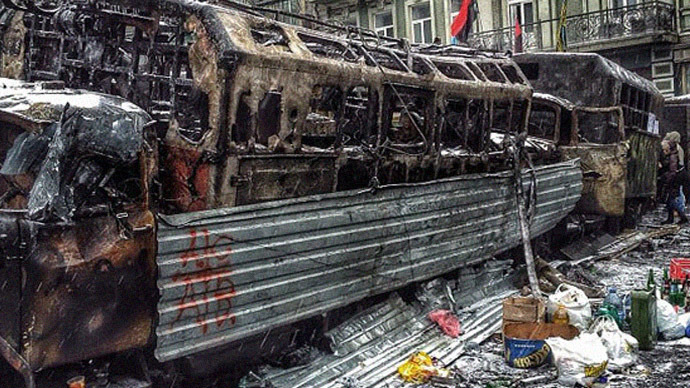 There may be no machine-gun fire or tanks in Kiev, but the city looks like a warzone. And soldiers of the opposition appear to be a close match to officers of the law, if not in terms of discipline, than certainly in terms of equipment. 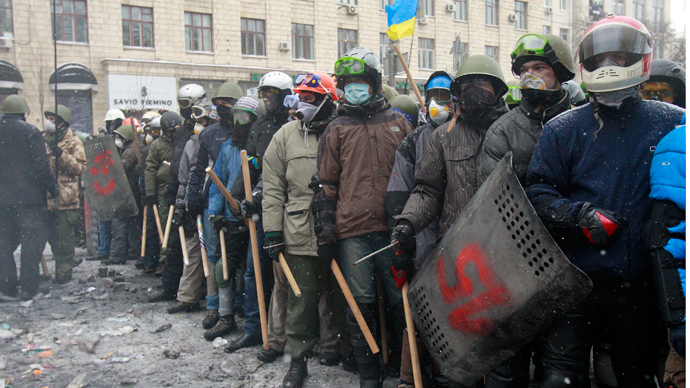 Riot police have helmets, shields and body armor. So do the rioters. The radicals are easily distinguished by the orange construction workers’ helmets many of them wear. But there are also motorcycle helmets, military helmets and even replica knight helmets. The rioters are armed with homemade shields. Though they may look amateurish compared to police officers’ metal ones, they are actually quite effective at blocking rubber bullets. Some have also obtained riot police shields. And they know how to use them to form a tight, well-defended line. Other protection gear includes gas masks that render police tear gas useless. Apart from individual gear, the rioters know urban guerrilla tactics, like stretching nets over barricades to catch police stun grenades. The protesters are also well-prepared for offensive. They have a wide assortment of melee weapons. Unlike police batons, their home-made maces and spears have spikes and are designed to draw blood. The most popular projectiles are stones taken from the pavement and Molotov cocktails. Petrol bombs were extensively used in the initial clashes with the police on Sunday. Some officers hit by the Molotovs were badly burned. And some police vehicles burned out completely. Fireworks were also extensively used against the police, which made the confrontation look hauntingly jubilant at times. The protesters erected a catapult (or more precisely a miniature trebuchet) to launch their projectiles a great distance. The machine proved to be ineffective and was eventually destroyed in a police raid. The rioters replaced it after with a giant sling. The rioters also have pneumatic and low-lethality firearms. Only mildly-effective against protected police, they may look like real firearms from distance. Where the police beat the opposition is with stun and tear gas grenades. But in one episode the rioters said they intercepted a box of 340 stun grenades meant for police. It’s not clear whether the claim was true. The radical activists stockpiled irritant chemicals like ammonia to use against the police as a sort of tear gas. There were also unconfirmed reports that they planned to use Molotov cocktails with concentrated alkaline drain cleaner added, so that the bombs not only set their victims on fire, but also left severe chemical burns. 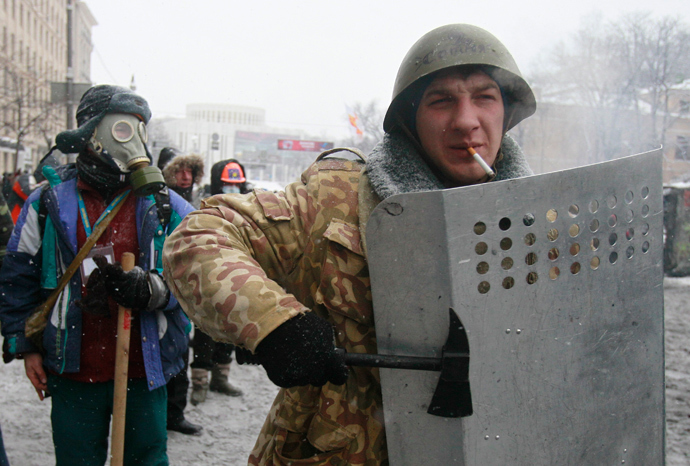 It’s true that Ukrainian riot police are not beyond criticism. They were involved in deplorable actions, including vicious brutality against unresisting protesters, as footage from the Wednesday crackdown clearly shows. However, many of the people they stand against are far from peaceful and non-violent. They are geared for a guerrilla action, and they are conducting one.